Managua (AFP) - Nicaraguans were back on the streets in their thousands on Sunday to protest what they called a government breach of a two-day truce agreed during Church-mediated peace talks. Students at a university in northeastern Managua claim police attacked them during a demonstration outside the campus on Saturday night in which four students were shot and injured. 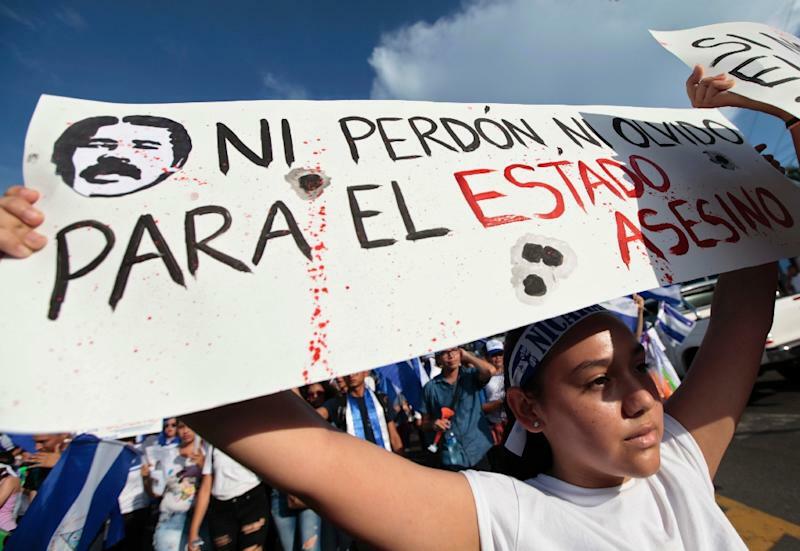 Police said in a statement they had complied with the truce, agreed during Catholic Church-mediated talks between the government of President Daniel Ortega and opposition groups demanding his ouster. The aim of the truce was to create a calmer climate and allow an investigation into the deaths of dozens of people in a month of anti-government protests. Protesters in Mangua and other main cities demonstrated against the police action, which was strongly condemned by the university's rector, Telemaco Talavera. In Managua, protesters carried Nicaraguan flags, banged pots and blew whistles to call on Ortega and his wife, Vice President Rosario Murillo, to resign. Despite the renewed tension, a third session of talks is scheduled to go ahead on Monday. Meanwhile, a delegation from the Inter-American Commission on Human Rights have begun probing the deaths recorded by rights groups since the protests erupted mid-April. Offices opened by the visiting delegation in Managua and the towns of Masaya and Matagalpa were filled at the weekend with relatives of those killed or disappeared, many of whom waited several hours to file their complaint. "I am devastated. My son was taken from me. I came here to see if (his death) had been verified," Martha Mendoza, an employee of the state prosecutor's office, told AFP through tears. Another mother, Guillermina Bracamonte, said police had killed her 19-year-old son, who had traveled from a rural area to find work in the capital. The Nicaraguan Center for Human Rights said the protests, initially prompted by social security reforms, had left 63 people dead, more than 500 injured and an undetermined number of missing.